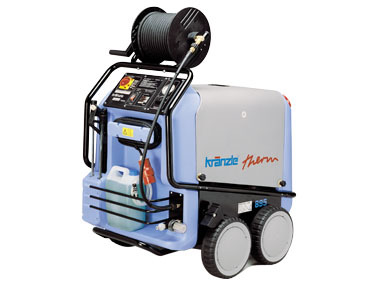 Kranzle Therm 1165 Steam Cleaner with 20m hose & reel. Want to see the Kranzle Therm 1165 in action? A solid, well designed and reliable hot water and steam cleaning machine suitable for transport yards and other heavy duty applications. Will rapidly ‘melt’ off grease, oil and heavily encrusted dirt. Operating pressure 2350psi. Has many innovative technical features to enhance cleaning efficiency and safety. The uniquely designed heating combustion chamber ensures low diesel consumption and low exhaust emissions. 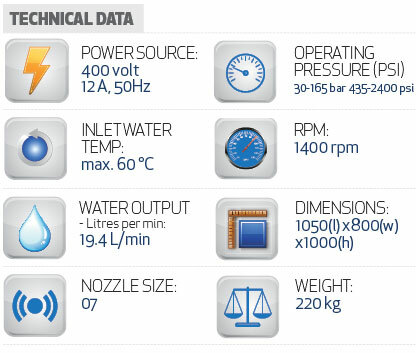 Optional 20 meter high pressure hose and integral hose reel. Full 2 year Warranty on the machine plus ten year guarantee on the solid brass pumphead. This top quality German engineered machine has many inbuilt features to enhance cleaning efficiency and safety, while the uniquely designed water heating system will save you big dollars in fuel consumption!